Kitchens are the busiest room in the house and where all your culinary magic comes alive. But this is still the kitchen after all, and silly accidents are bound to happen. Being prepared for those unexpected moments can make all the difference — like when you damage the handle of your favourite knife. With Sugru, little accidents like this aren&apos;t a big deal, they can just be your next project! You can fix it yourself in no time. Here we&apos;ve used brown Sugru to repair a knife handle that got burnt on the cooker. Step 1 — Clean and dry the surface of the handle, and remove any loose pieces. 24 hours later the Sugru will have turned into rubber, and your trusty tool will be back in action (it might even feel comfier than it used to). 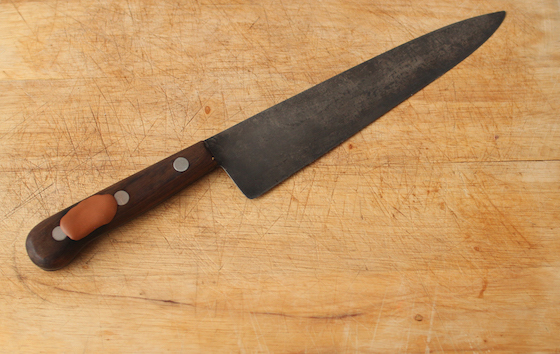 Having a good knife can turn a chore into a pleasure, it&apos;s not called the most important tool in the kitchen for nothing. Sugru is perfect for fixing things like this around the house. It bonds to lots of different materials and is also heat resistant up to +180°C. Once cured, Sugru is easy to clean with soap and water, and it&apos;s dishwasher safe too! So when something like this get damaged in the kitchen, think of Sugru. But why wait until something breaks? Sugru can be used for loads of clever little improvements around the home. Oh and If you want to improve your knife skills, Jamie Oliver can teach you the basics in 5mins flat! Please note: Sugru isn&apos;t certified as food safe yet, so it shouldn&apos;t come in direct contact with food or drink.